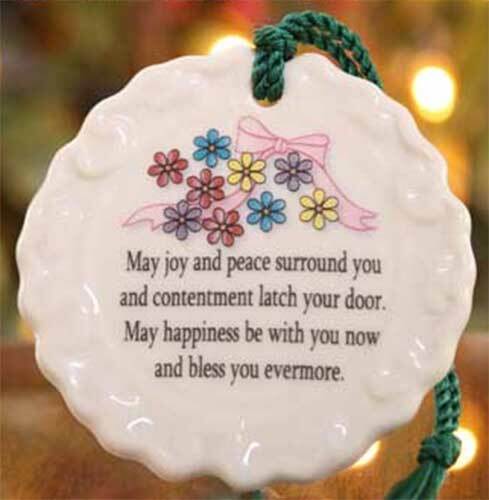 Belleek China Christmas ornament features the Peace and Joy Irish Blessing. and contentment latch your door. The Belleek ornament features an Irish blessing along with a floral motif and an embossed border on both sides. The Belleek blessing ornament measures 1/2" diameter; it is ready to hang on your Christmas tree with the included green cord. The Belleek Irish blessing ornament is crafted of fine china. This Irish Christmas ornament is handmade in Belleek, Ireland and it is gift boxed, complements of The Irish Gift House. 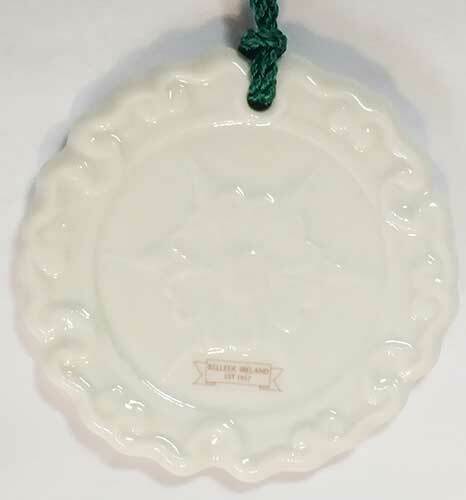 Belleek ornament features the Irish blessing along with green shamrocks on a miniature china plate. Belleek ornament features an Irish house blessing along with shamrocks and Celtic knot-work. Belleek ornament is a double sided china design with an embossed Claddagh along with the sentiment of the iconic Irish symbol.